Adam Eddington is a hopeful marine scientist who nabs an incredible internship. He will be working with the esteemed Dr. Calvin O'Keefe on his starfish research in beautiful Portugal. But Adam hasn't even embarked on his plane before things get weird. A beautiful young woman approaches him in the airport and warns him that all is not as it seems with the O'Keefe family. He will have to decide if his allegiances lie with Dr. O'Keefe and his warm and inviting family or the intriguing Kali and all the wealth and power that she can offer. 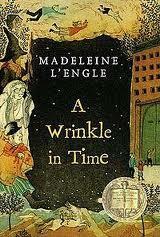 I love reading L'Engle's books and seeing how characters from one book interact with new characters in other books. Adam gives us an outsider's look into the O'Keefe family, whose parents are the beloved Meg and Calvin from A Wrinkle In Time. This story starts off fast and doesn't let go until the end, as Adam debates ethics and who he can trust. 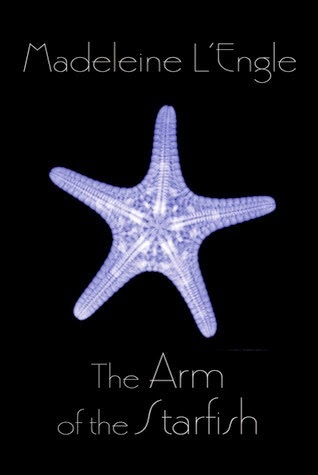 The Arm of the Starfish is perfect for the adult looking for a quick but satisfying read or the teen who realizes that declaring your allegiance to someone or something isn't always as simple as it seems. The Legacy of Lost Things follows an Armenian family as they struggle to find their place in America. Levon feels greater allegiance to his mother and sister than to his wife and daughters, and his wife Tamar is still consumed by thoughts of her first love. Daughters Araxi and Sophie are witnesses to their angry and occasionally violent marriage, as well as the cultural constraints that still trap their family. Araxi finally has enough and runs away, leaving her parents to wonder what they could have done to make their daughter stay. 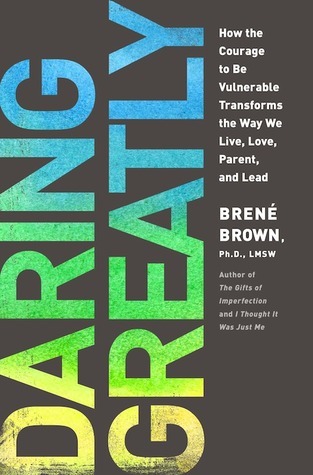 I enjoyed this book, especially the insight it gave me into a family struggling to maintain their culture in the midst of a very different one. I appreciated Zilelian's attention to the ways that the Armenian genocide continues to impact families. The perspective jumps from character to character with each chapter, which can take some getting used to (especially in the beginning when you are still working out how people are connected to each other). My only true qualm with this book were a few moments that seemed much too heightened considering what had happened before, especially when it comes to Araxi. 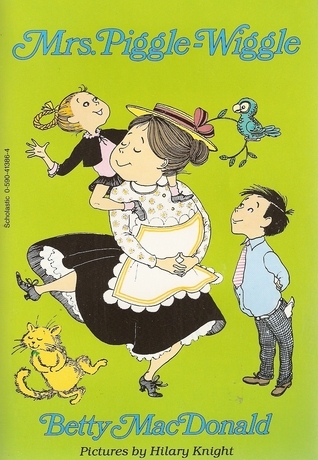 These characters have lost their homes, their identities, and their connections to each other. Each one of them tries to stick it out, to follow tradition, to do the "right thing." But as Levon, Tamar, Araxi, and Sophie try to find happiness, they discover that it sometimes means breaking free of what they have always known and what is expected of them. This is a good debut and I will be interested to see what this author writes in the future. It's Monday and it's almost Easter! So this week didn't go quite the way I had hoped. After sick kids last weekend, it was of course time for hubby and me to have our turns. But after a rough few days, things seem to be mostly back on track. It's a good impetus to start some serious spring cleaning, anyhow! This will be an interesting week for us. My husband is a pastor, which means Holy Week is both crazier and quieter. Our plans for this week include getting Easter outfits for the kids, rehearsal for me for the Easter music, and a church dinner on Maundy Thursday. And of course, reading. We always find time for reading in this house. 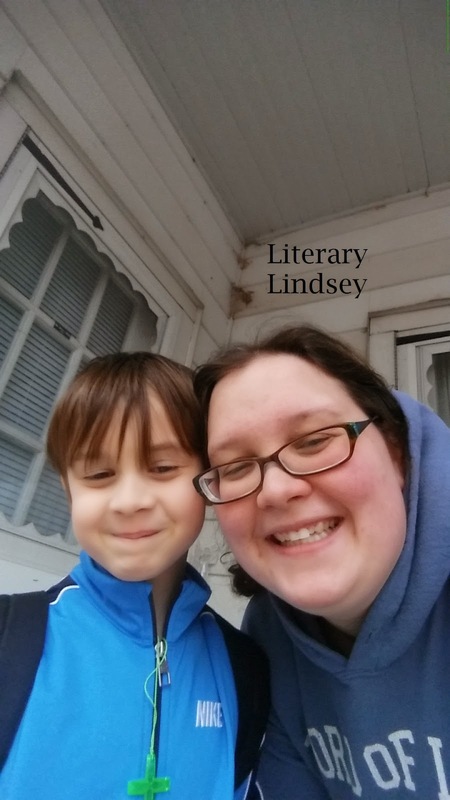 I was so excited to participate in the "A Day in the Life" blogger event. I knew just the day to take you along with me - Wednesday! It would be a really interesting day. I was going to drive to an editorial meeting for a project I'm working on, and then that night I would take you to voice lessons and rehearsals with me. 7:15 a.m. David comes in to loudly announce that it's time to wake up. It wasn't quite, but now I am certainly awake. I get up, check my phone, brush my teeth, and grab David some clean clothes out of the dryer. Then I take a moment to do an important thing - an allergy pill and a tall glass of water are vital to start the day! After that, I pour a gigantic bowl of cereal (how do seven year olds eat so much?!?). 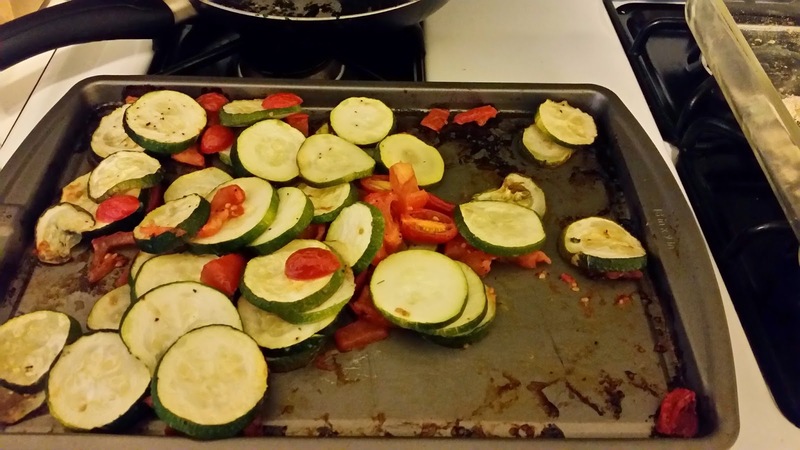 7:45 a.m. Time to make lunch for the boy. Today, he is having a peanut butter sandwich, blueberries, carrots, and donut holes for a treat, along with a juice box. I put a piece of toast in the toaster for me and then sit with David and eat with him as he reads me jokes. 8:15 a.m. Back upstairs for me to get dressed and ready for the day. When I get back downstairs, the boy has cleared his place and is putting on his shoes! It's as if he knew this day would be recorded for posterity...Then it's off to catch the 8:35 bus! Ah! We're late for the bus! Just kidding. We are right on time! 8:45 Back home! I take a few minutes to check in with the hubby before he gets ready for work and then it's time to start the day with this beautiful girl! 9:30 a.m I get the little lady dressed for the day and we start off with a rousing rendition of some songs on the piano that are known only to Becca. "Song, mama, song!" I thought we might go out today to find some Easter clothes, but it is pouring outside and I am just not going to do that with a toddler, thank you very much. So we spend the morning reading, coloring, and playing with those Fisher-Price little people. We also try to play a game of catch, but it mostly devolves into Becca running away with the ball and laughing maniacally. 11 a.m. It's snack time! We have a very civilized set-up this morning, with both of us sitting at the kid's table with our respective books. 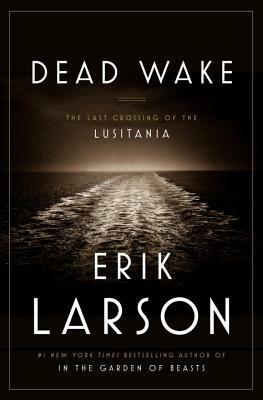 I'm reading Erik Larson's Dead Wake and Becca is enjoying her big brother's library book Liberty Porter, New Girl in Town. 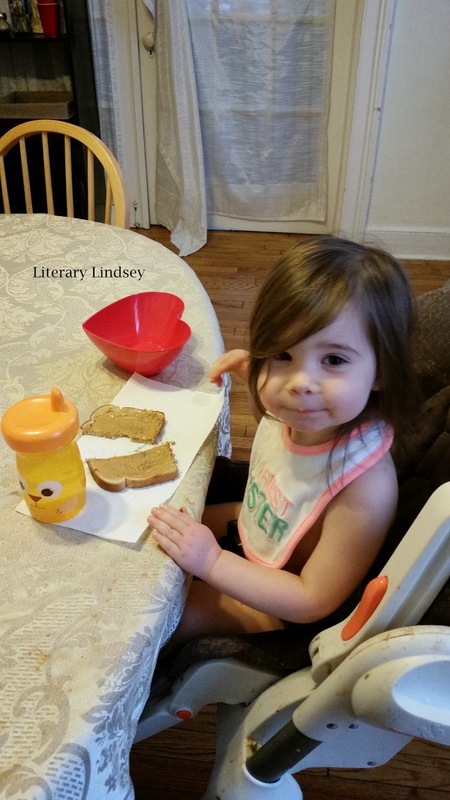 She is very kindly sharing her bunny grahams with her mama. 11:30 We call to chat with my mom (Grammy) and have a lovely conversation with only occasional temper tantrums when I try to take a turn talking. Also, we somehow conference call with someone from Russia...You can't make this stuff up, guys. 1 p.m. Now we are getting to work. Sometimes when you have a sick family, your kitchen gets a bit out of control. 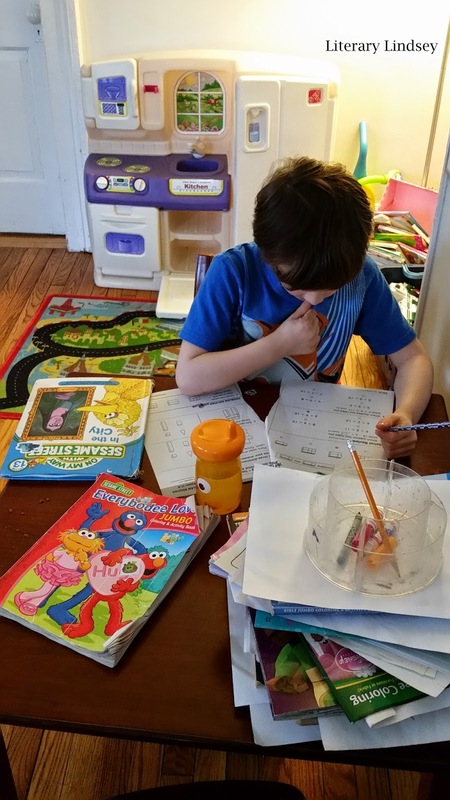 It's a disaster zone around here - time to tackle the mess! Then it's time to put away laundry and chat with the husband when he gets home. 3:30 p.m. It's off to the bus stop to pick up the boy! This begins the long free-fall towards bedtime. David plays in the backyard while I get Becca up and give her another snack (she's not much for lunch so I do snacks before and after naptime). Then David comes in and does his homework and chores. The electrician comes to repair some things, so we can have power to our living room again. I start dinner while Becca does puzzles and David plays in his room. 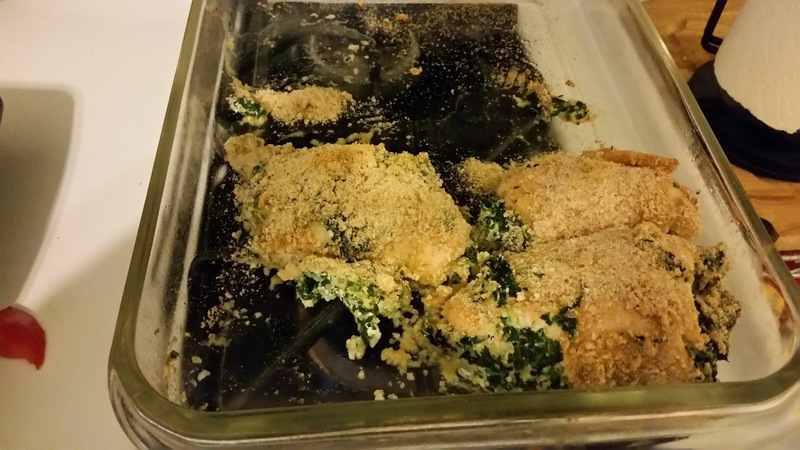 Tonight's menu is chicken stuffed with feta, ricotta, and spinach along with oven roasted veggies.The kids eat while husband finishes up with the electrician. 7 p.m. Then it's time to get ready for bed. Stories and teeth brushing for everyone! After the kids are in bed, the hubby and I finally sit down for some dinner together. 9:30 p.m. 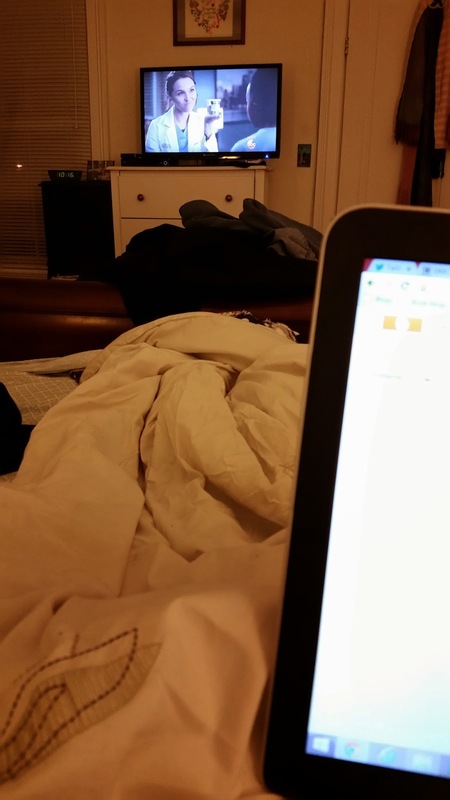 It's time to get in bed, watch some tv, and finish this post. I'm one tired gal. Thanks for joining us for this day and thanks so much to Trish for hosting! 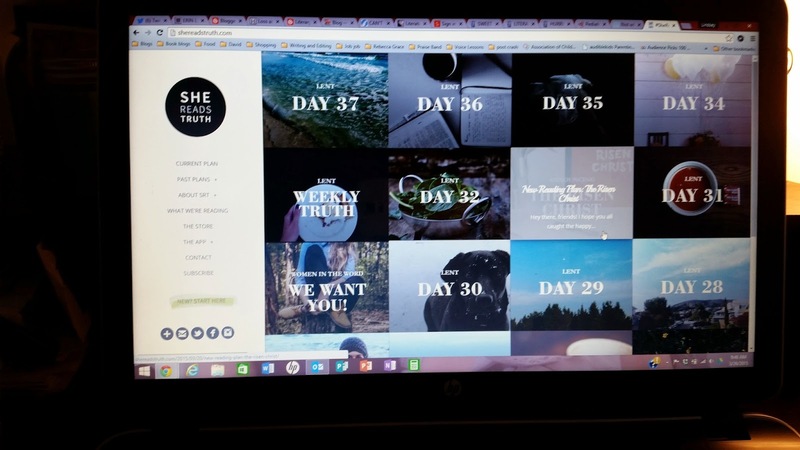 Check out the days of other bloggers at Love, Laughter, and Insanity! Everyone knows Virginia Woolf, the incredibly talented author of To The Lighthouse and Mrs. Dalloway. But she is not the only gifted one among her family and friends. The Stephen children - Virginia, Vanessa, Thoby, and Adrian - are at the center of a group of writers, artists, and thinkers who will shape the 20th century and become known as The Bloomsbury Group. Vanessa is a painter who is also an expert at caring for her sister and her fragile mental state. When Vanessa falls in love, Virginia is not pleased at losing first place in her sister's life. Their relationship starts to unravel and the repercussions will be felt throughout their art, their family, and their group of friends. 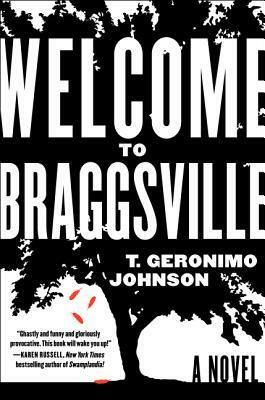 I loved the focus on family in this novel, both the people related by birth and the friends that become family. Vanessa and Virginia are a bit scandalous in their time because the friends and colleagues of their brothers become their friends as well. It is easy to see the concern that they share for each other's personal lives and the evolution of their talents. I also loved Parmar's depiction of great artists and writers in their early years, when they were not confident in their abilities. It's fun to know what they will become, even when the characters themselves don't. Vanessa is the older sister but the one who is less known for her art. Vanessa grapples, as so many women do, with caring for others and pursuing her own passions. Is Vanessa a little-known artist today because she spent so much of her life caring for her husband, children, and her unpredictable sister Virginia? It's very possible. Parmar gives Vanessa a greater voice than she perhaps had in life by creating a fictitious journal for her. 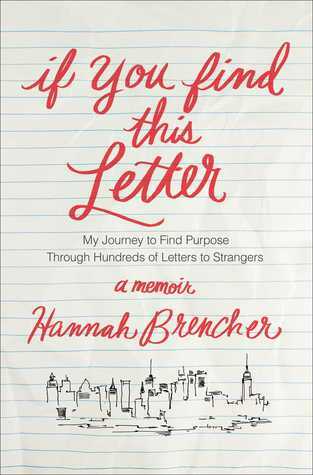 The journal is interspersed with letters, postcards, and telegrams both from Vanessa and the family and friends who enrich and complicate her life. It is a rare historical fiction novel that finds balance between establishing the time and place and telling the story of specific people. 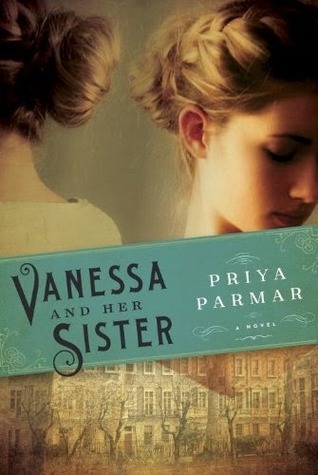 Pirya Parmar does this effortlessly as we watch Vanessa both follow and defy the expectations of the era in which she lived. At its heart, this is a story about love - about forgiving when our loved ones hurt us, about loving to create, and about the choice to love and care for ourselves. Thoughts from David: Sonic saving the world! Well, I guess at least from making the world go ka-boom! Yeah, I'm right about the ka-boom part because they're saving the world from certain blow up. They need to save lots of people, don't they? Saving the whole world is a lot of responsibility. It'll take the abilities of the entire freedom fighters. Now let's get down to the point. Get it? Like a point of something? Well, now that you mention it, I gotta say Sonic is definitely going to need his friends this time. He can't save the world on his own. But this time, I guess he'll probably want to avoid Amy Rose and Sally Acorn flirting with him 'cuz one of them can. And that's Sally Acorn because they are an ex-couple. Alrighty, I think that I should tell you something. In order to find out the conclusion and some more parts of the story, you're going to need to read the book! See you next time! It's the most wonderful day of the week! Well...maybe. It's at least a little more fun when we join up with the gals over at The Broke and The Bookish to share our favorite literary lists. This week, we are talking about the childhood favorites that we love to revisit. Who wouldn't love to come home and find a mysterious box that would whisk them away to magical lands? This book is brilliant and the humor is perfect both on children's and adult levels. Oh Meg. She's probably my favorite young heroine. I have always adored L'Engle's love of both religion and science, faith and reason as well as her ability to tell a fantastic story. This is the book I will pick up time and again (along with its sequels) if I am having a bad day or find myself in a reading rut. Five children discover a magical sand fairy on the beach by their new home. He will grant them one wish per day, but the wishes only last until sunset. 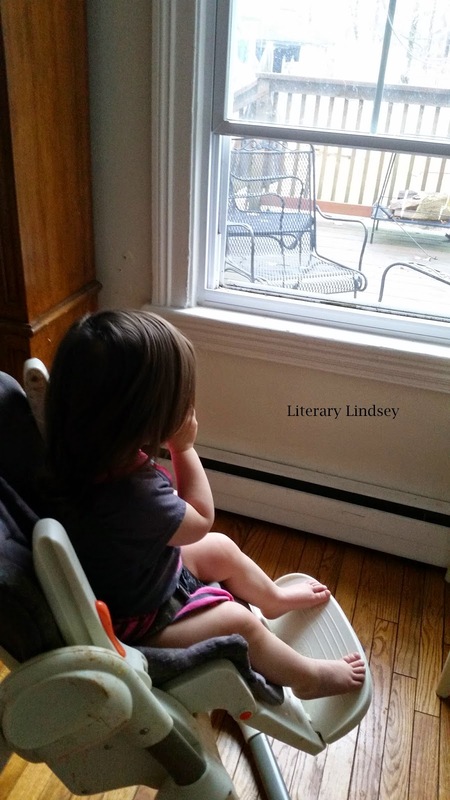 The children quickly discover that wishes aren't all they are cracked up to be, The story may seem overdone to contemporary readers.The story may seem overdone to contemporary readers. 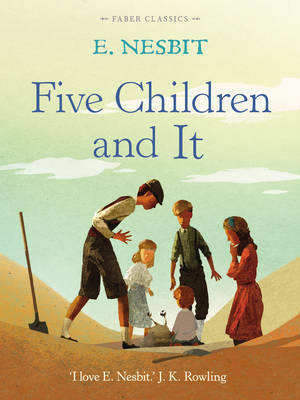 The story may seem overdone to contemporary readers, but this story is a lovely portrayal of Victorian times for a young reader and I love how the siblings relate to and care for each other. It's probably the worst nightmare of many children - their parent abandoning them. 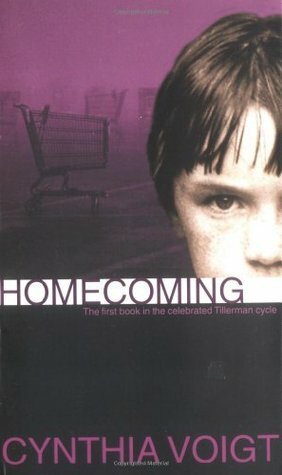 For the Tillermans, it's real life when their mother leaves them in the car to go into the store and never comes back. Dicey is the oldest and must suddenly take responsibility for her three younger siblings and find them a new home. This whole series is excellent, especially for the ways in which Voigt portrays children who are introverts instead of the stereotypical bright and friendly kids. Ah, Mrs. Piggle Wiggle. I must confess that I've wished for her to appear a few times since I started this parenting gig. She is a witch who was married to a pirate and lives in an upside down house with treasure buried somewhere on the premises. She also has wacky but effective cures for all of the most terrible behaviors of your children. Your son won't pick up his room? Leave him there until he must clean his way out. Your daughter is talking back? Get a parrot to imitate her until she realizes how awful she sounds. The kids don't want to go to bed? Let them stay up until they beg you for bedtime! This series is one for the ages and will make both naughty children and their parents chuckle. 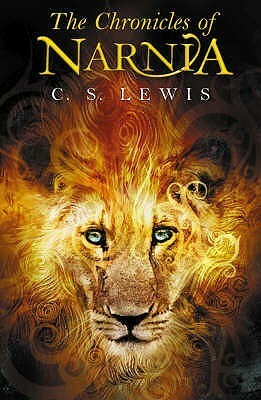 I don't remember how old I was exactly when I started reading The Chronicles of Narnia, but I will remember forever the way my mother's much-beloved copies looked. I think for a lot of us, this series was one of the first that really spoke to our imaginations and helped us to imagine magical lands and incredible companions, and confirmed that we could be the heroes of the story. 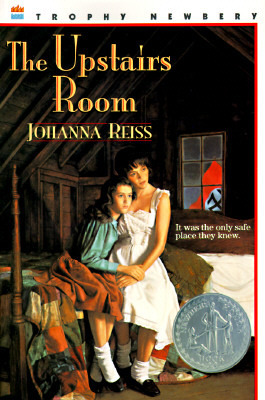 This book and Number The Stars were the first stories I read about Jews living in hiding during the second World War. 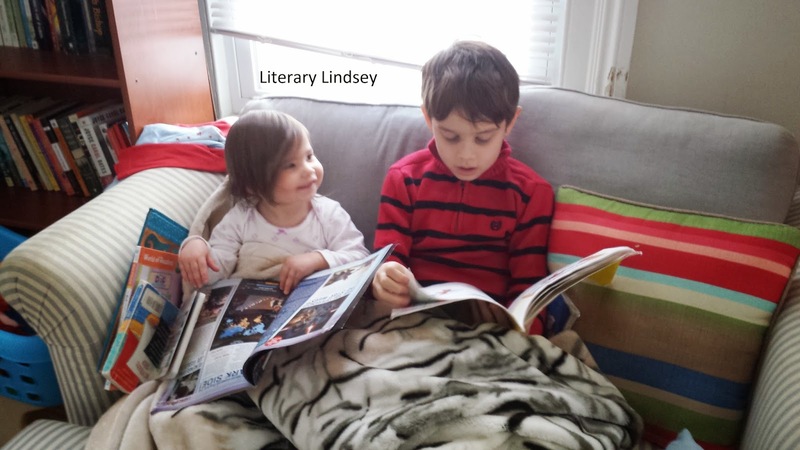 They sparked a life-long love for books set during that time period. 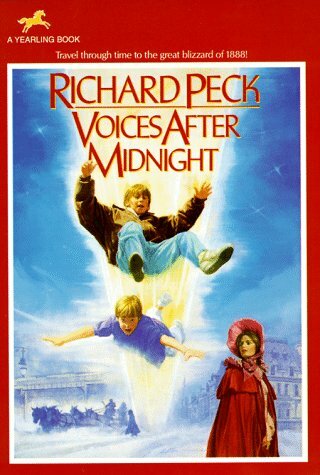 This story is about a boy and his brother who fall through time (as wonderfully shown on the cover) and land in New York City 1888. Of course, a terrible blizzard is on its way. Will the boys survive the snow? Can they make it back to the present? I loved books where the characters went time-traveling. I guess I've never given up hope that I might open a door and suddenly be transported to the past. Because of course. Does Anne need any explanation? 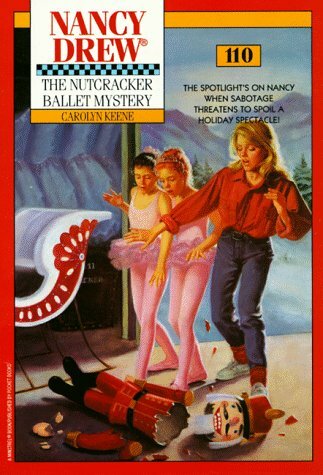 Every girl who loved books went through a Nancy phase and I'm not ashamed to admit that I will occasionally read through a mystery or two on a certain kind of rotten, no good, very bad day. 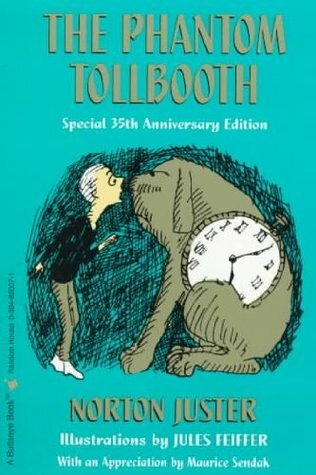 Which childhood books do you love now as much as you loved them then?? It's Monday - Away With You, Germs! Yuck. It's been a rough few days. I am hereby decreeing that both children should not be allowed to be sick in the same week. I have now met my quota of cleaning up after sick kids for the year, thank you very much. On a happier note, I think this should be a really fun week on the blog. 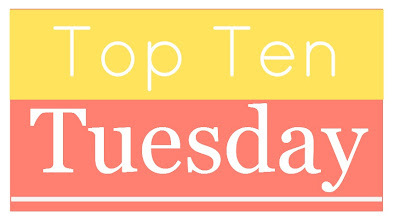 I'm participating in a great Top Ten Tuesday and joining in with Trish to record and share A Day In the Life. 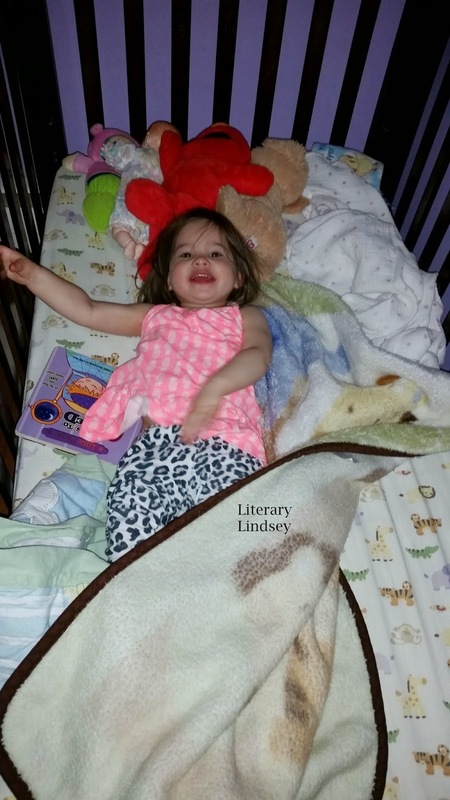 I'm excited to write about our crazy lives and see what you all are up to during a day! Chimamanda Ngozi Adichie's collection of short stories feature characters who are trying to find out where they belong in two very different cultures. They are Nigerian women who have moved to America or American women visiting Nigeria. Some of them are just taking a trip, some are becoming citizens of a new place, and some are hoping to leave their past behind forever. Each protagonist draws you deep inside their minds and hearts as they share their deepest secrets and desires and make the most difficult decisions of their lives. I have wanted to read Adichie's work for a long time now. 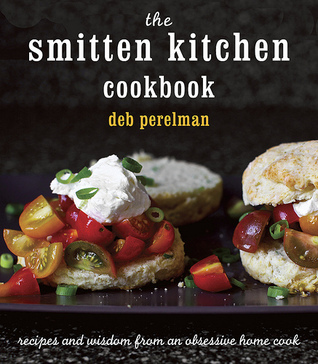 I knew that this book was something special when I closed it and remembered each and every story. 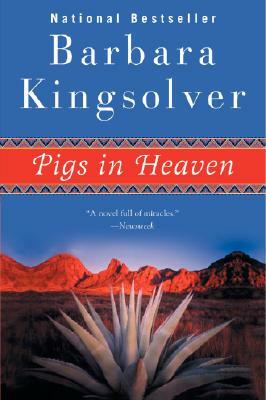 Usually when I read a collection of stories, some of them will stand out and others will be quickly forgotten. In this case. I could still recall each of the protagonists and each time my heart jumped into my throat when Adichie surprised me or beautifully captured what it meant to be in love, to want something better, or to feel utterly alone. In "Cell One," the first story in the book, a young man goes to prison after getting caught up in a local gang arrest. "Imitatation" finds Nkem changing her appearance after she finds out that her husband has a mistress back in Nigeria. Chika hides out during riots with a Muslim woman in "A Private Experience." In "Jumping Monkey Hill," Ujunwa find that her stories will only be accepted at a writing retreat if they uphold a specific version of being African. And in the title story, Akunna finds life in America completely different than she imagined and wonders if a new romance can lessen the feeling of never belonging. 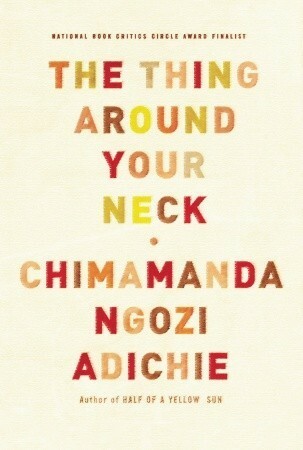 The Thing Around Your Neck is the perfect way to dip your toes into Adichie's work. 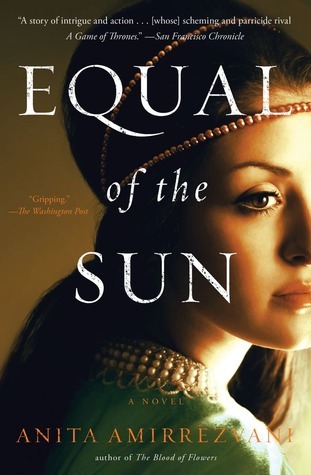 I'm looking forward to reading her novels and spending more time with her precise writing, fascinating characters, and insights about belonging and finding a balance between two very different cultures. 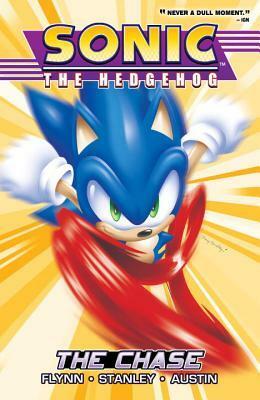 Mama opines: I have to confess that my knowledge of Sonic is non-existent. 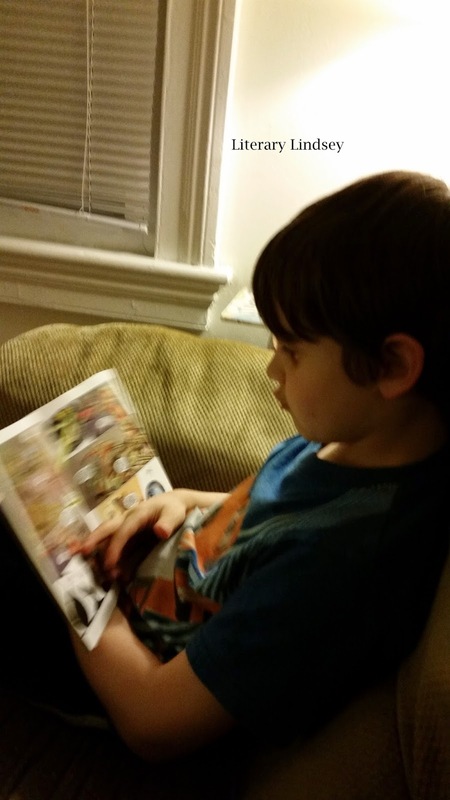 I'm enjoying watching David discover new comics to enjoy, though. Does anyone have suggestions for other kid-friendly comics? Thoughts from David: I can't get enough Sonic! It's just too much fun. I love all of those characters, especially Mina and I can't get enough Mammoth Mogul either or Mighty the Armadillo or Miles "Tails" Prowler! And I especially can't get enough Sally Acorn and Cream the Rabbit and Cheese the Chao. Well, enough with the characters! Let's get to the main part of this. The main part of Mogul Rising is that Sonic must join Mammoth Mogul's new group of villains in order to save his friends. You can see his friends at the top of this review. Now what I don't understand is why Rotor built a passageway to the special zone. If he made a passageway, they would just get their doubles of themselves because that's where their doubles live. The thing is some of those bounty hunters in these stories are just clueless about what they're doing. They're following order blindly, apparently. At least it looks like it. What I don't know about is why Bunnie looks different in Sonic: Saga Series than she does in the Sonic The Hedgehog series. Now, well, I think I should end it off with a joke. Here's my joke! Why did Mammoth Mogul try to snort? Because Tails was interrupting him! Well, see you next time! 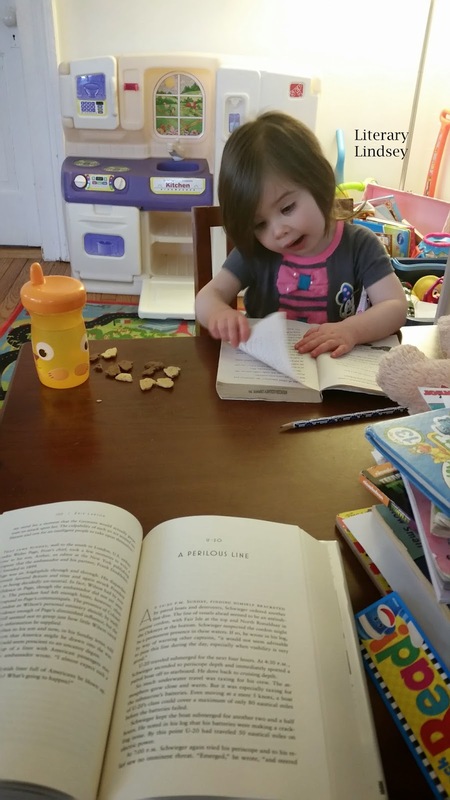 Samantha Ellis has been a reader for as long as she can remember. 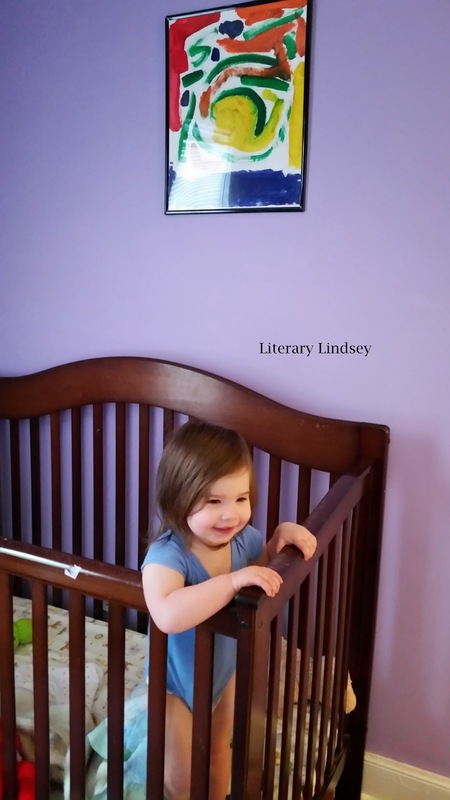 As she discusses literary heroines with a friend one day, she suddenly realizes that she has spent years trying to emulate Cathy Earnshaw from Wuthering Heights. But maybe she should have been trying to be like Jane Eyre instead. 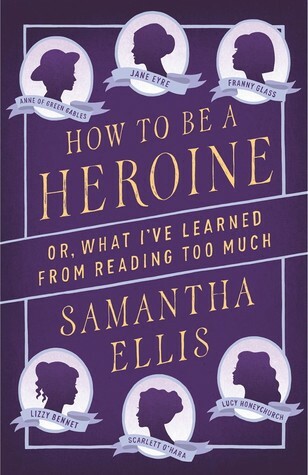 Ellis decides to go back and re-read all of the books she loved as a girl and discover which heroines she still loves and which ones have changed with time and years of perspective on life, love, and literature. Our author is perhaps particularly suited to write about literary heroines, as she herself is a playwright. Each chapter features a few books that correlate to a certain period in Ellis' life - finding friends, falling in love, or starting a new job. 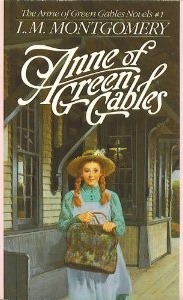 She found fellow kindred spirits in imaginative Anne of Green Gables and fellow writer Jo March. When Ellis suffers from seizures, she looks to the suffering of Sylvia Plath and her character Esther in The Bell Jar. 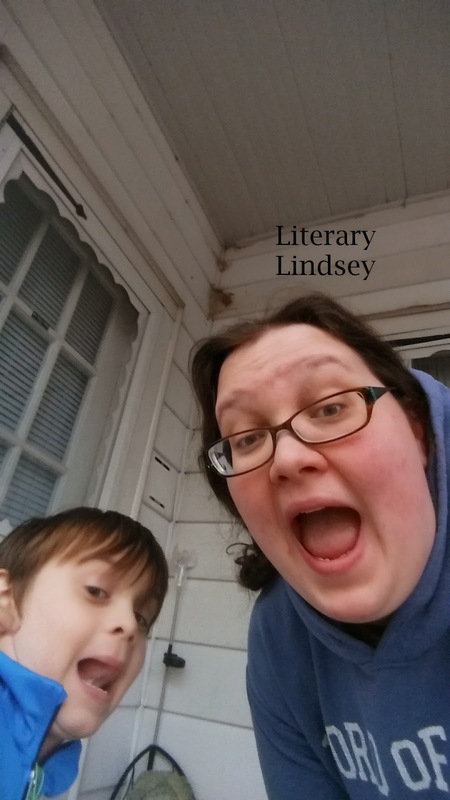 She has great insight into these stories and characters and the ways in which they shaped her childhood and continue to inspire her as an adult. Some of the most fascinating chapters are the ones where she sees a story one way in her youth and in a completely different way as an adult. It would be easy for this book to become trite, an exercise in retelling beloved stories or navel-gazing as Ellis tells her own stories. 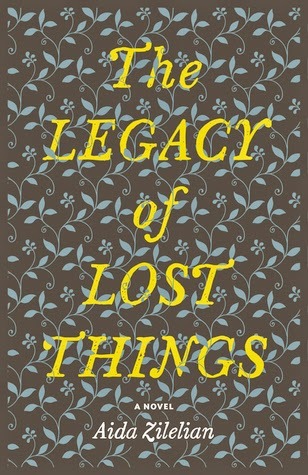 But we are treated to both engaging analysis of characters and themes and really fascinating autobiographical writing. Although many of the women she is engaging with are written decades or even centuries before her life, Ellis is part of an Iraqi Jewish family that is living in London but holding on tightly to their traditions. From an early age, she was told that her focus should be on finding an appropriate husband, not writing and certainly not going to college. 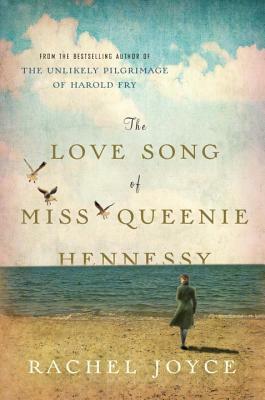 The history and heritage of this particular family gives her insight into characters yearning for freedom over their own lives. I worried at the outset that I would be confused, as I haven't read all of the books that Ellis references. Somehow though, she hits the perfect balance of giving enough information to bring new characters to life while not boring you when discussing characters you know and love. 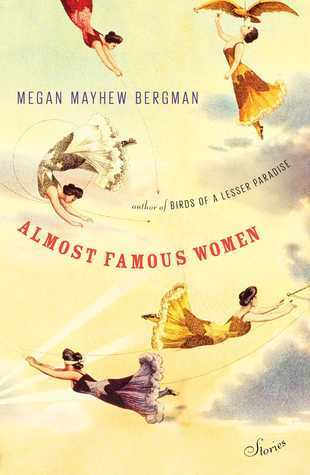 This is the book you want to read and then discuss with all of your friends as you talk about the women, both real and literary, that shaped you. It's Monday again? Who let that happen? So this week. That was a thing that happened. Thing are moving at their usual level of insanity around here, especially as we move towards Easter. I'm pretty sure it's still February most days only to discover that it's halfway through March. Yikes! After a crazy and hectic week, it was nice to find a little relaxing time with chocolate chip pancakes and reading time with the kids on Saturday and visiting with my mom on Sunday. 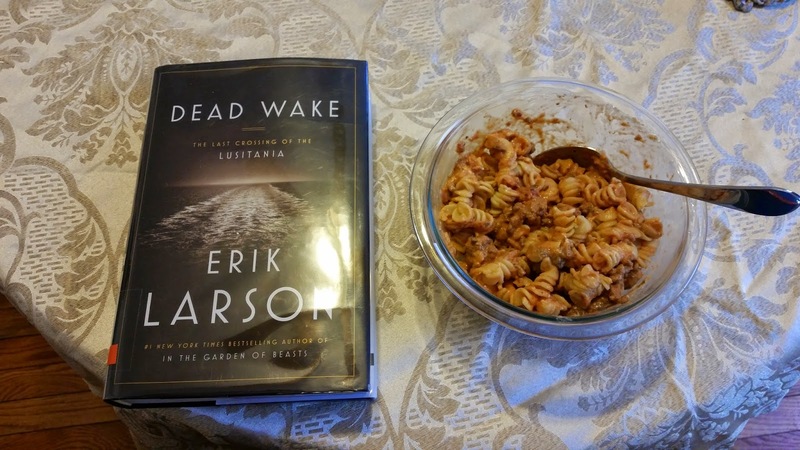 It's Monday - Did you join the Flash Readathon? It's Monday again! Holy cow!